It can monitor up to 4 NO/NC contacts. These may be connected to any 4 Voltage Free Alarms. Whenever any alarm is activated the system automatically sends SMS directly to up to 4 nos. 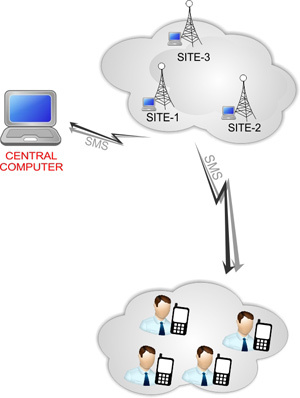 The SMS's are sent to people based upon user defined time escalation matrix. For example: Technician may get the alarm SMS immediately, the Supervisor can be intimated 30 minutes later, the Technical Manager can be intimated 1 hour later or so on. Whenever the alarm is cleared, the 'Alarm clear' SMS is automatically sent to the people to whom the SMS was sent earlier when alarm was activated. This implies if only 3 people were sent an SMS when alarm got activated and the alarm got cleared then the 'alarm clear' SMS shall be sent only to the first 3 people. We provide a easy to use Windows based software that can remotely configure the phone nos. as well as escalation matrix for every site. The system can be used for a single or hundreds of sites. Our hardware includes a GSM modem; however, SIM card has to be provided by the customer. It works on 48V DC +/- 15%.